When I was a university student, I once organized a kung fu/ramen party. This consisted of renting martial arts movies and providing a wide variety of instant noodles to eat along with the action. “What kind of party is this?” said my then boyfriend (now husband). I explained to him that it was a great way to combine two of my favourite pastimes. He looked at me incredulously while a steady stream of people filtered in, many of whom expressed surprise upon discovering I was the host and not some Korean guy named “Yong Suh Cho”. I’ve always had a weakness for instant ramen. Despite the fact that it is one of the most highly processed, nutritionally deficient foods around, containing on average about 500 calories of fat, carbs and enough sodium to recreate the Dead Sea in your stomach. Most instant noodle packages coyly describe themselves as containing “2 servings” so they can declare only half the horrifying calories, but who actually eats half a packet at a time? Still, there’s something so addictive about it that I can’t help giving into the dark side more than I should. 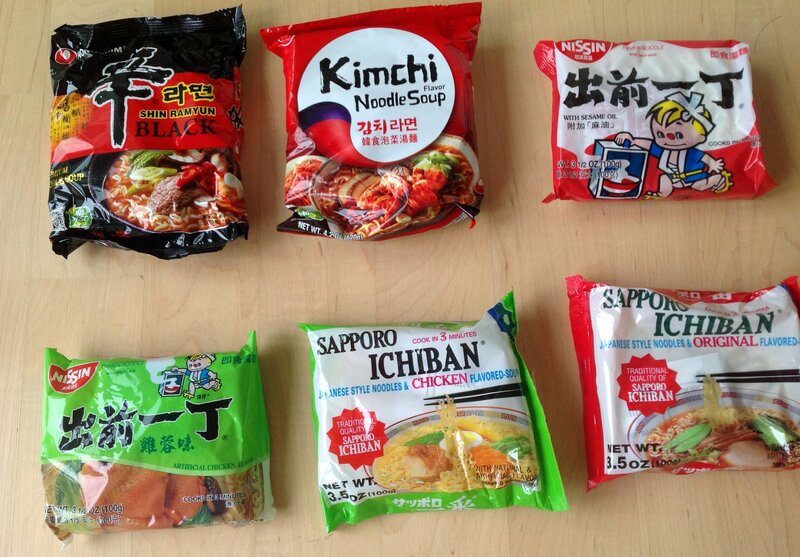 The amazing variety of instant ramen! So what type of instant ramen should you buy? This is a serious question given the mind-boggling variety that every Asian grocery seems to stock. At first, (a la Cook’s Illustrated) I thought about systematically taste-testing a dozen brands. However, this is impossible since, sadly, I’m no longer 18 and would probably pass out from an extended ramen diet. Instead, here are a few tried-and-true brands that I like. My #1 chicken flavour ramen is Nissin’s chu qian yi ding (出前一丁). Closely followed by Sapporo Ichiban. I also have a soft spot for the sesame flavour in both these brands. For spicy, there’s nothing like the classic Nongshim Shin Ramyun Black Label ramen which claims to have no MSG but is still insanely delicious. I also enjoy Nongshim’s Kimchee Ramyun which hits some sour and spicy notes, especially good with a cup of hot tea laced with condensed milk. Some favourite brands. Try them all if undecided. There is no “best” way to eat ramen. The terrible thing is that it almost always tastes good, whether eaten guiltily at midnight, or from a styrofoam cup in an aeroplane. My fallback method is to boil some water and gently poach an egg. When your egg is almost done, add some green vegetables and then your ramen. What I’ve learned over the years is to follow the timing on the packet. It stands to reason that this artificially engineered tastiness follows strict parameters, so if 出前一丁 says cook for 4 minutes, then you should set your timer for it. Recently, I’ve discovered a new way to enjoy ramen. Since it’s become an occasional indulgence, like foie gras or french fries, I decided I might as well go all out and eat it with lobster. Lobster is unbelievably good with Black Label Shin Ramyun. There’s something about the spicy decadence that sets off the sweet, succulent lobster. It’s so good, I don’t know why some fancy restaurant hasn’t started serving it in an egg cup as an amuse bouche. 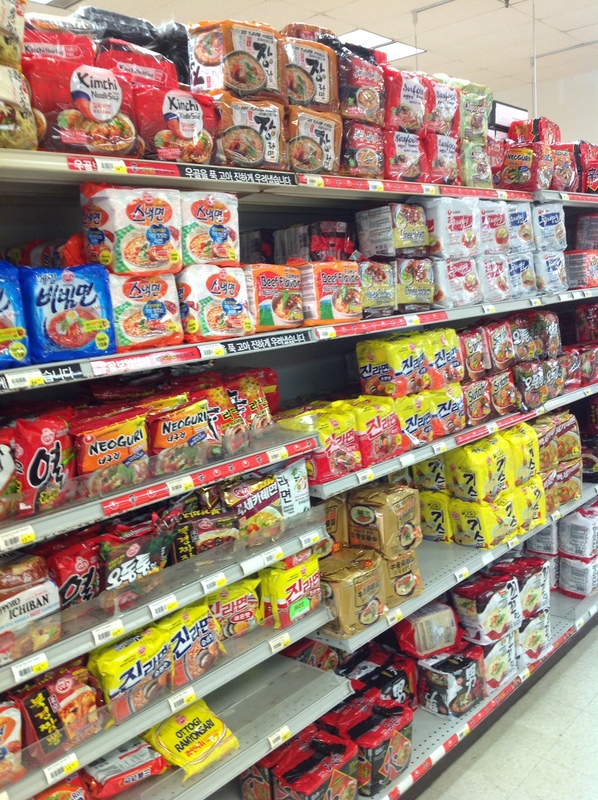 The day before, go to your local Asian grocery and collect all the ramen brands pictured above. You will only need the Black Label Shin Ramyun, but since you’re there, you might as well stock up. Also, buy a live lobster or two from the tank. If the Chinese guy tells you he only has 3 lb monsters in the tank, just keep asking him sweetly to look. 1.5-2 lbs a good size. Over 2 lbs gets a bit tough. Go home and steam your lobster. I like to do this late at night, when my children are asleep and can’t ask me things like “Mummy, can I keep this as a pet?”. There are lots of good Youtube videos on how to steam your lobster, but I usually put it in the freezer, then dispatch it with a butcher knife through the thorax before steaming. It seems less cruel to have a quick comatose death than be lowered alive into a boiling pot. 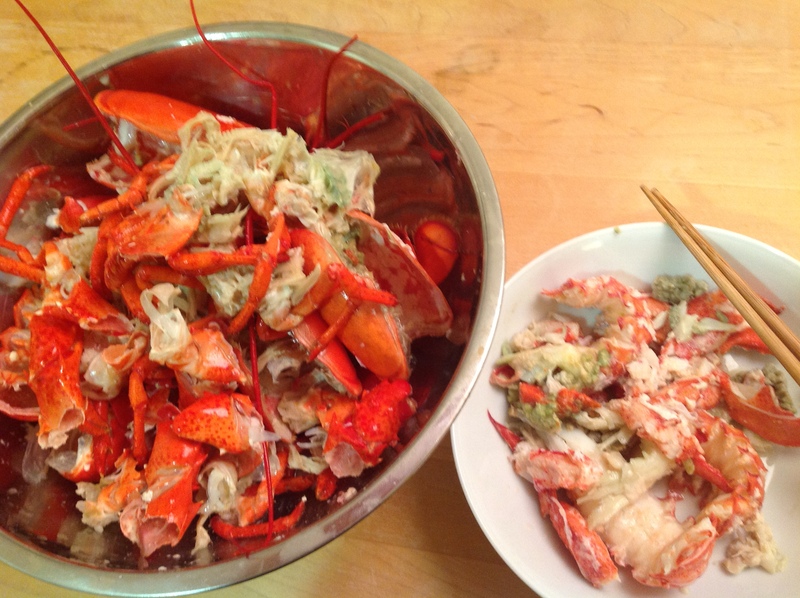 After steaming, remove all the lobster meat as well as the delicious green tomalley and coral roe if there is any. At this point, I usually have a nice late night lobster snack which is why you might as well cook two instead of one. The next day, cook your Shin Ramyun instant noodles according to the packet. Garnish with lobster, broccoli, and hard boiled quail eggs. Inhale the spicy aroma and eat steaming hot, while fanning yourself and mumbling “this is sooo good!”. Do not share. Haruki Murakami’s Hardboiled Wonderland and the End of the World. One of my favourite novels, where the protagonist is literally in two minds, this goes deliciously well with the high end/low end appeal of lobster ramen. Later this week, I’ll be in Singapore for the Singapore Writers Festival 2013. I’m looking forward to some great panel discussions as well as tasty local noodles (in preparation, I’m packing some roomy, smock-like clothes). If you’re in town, please come by – it looks like a wonderful line up of international authors. I’ll also be giving a book talk at the National Library (central branch) on Friday Nov 1st. What’s your favourite brand of instant noodles? ← So What Do Authors Wear, Anyway? I love Nongshim Shin Ramyun and the pairing with lobster sound like a dream! Several years ago, I did a team Iron Chef with Justin and some other friends. We came up with an idea of doing “elevated bachelor food” as our theme, and we decided to do a fancy ramen dish. The only problem was that we couldn’t decide what to use for the noodles. At that point, Justin came up with a brilliant idea: Just use instant ramen. We didn’t end up making it, but if we had, I guarantee we would have won. What’s tastier than instant ramen?! The only thing that would have beaten us would have been your recipe here. Now I want lobster and spicy, fried, nutrition-less noodles. When I was in high school, i used to open a package of ramen and deep fry it in oil. Shake a little seasoning on top. So crispy and yummy. This is before I had any concept of being mindful of caloric or fat intake. I used to preach to my kids about the evils of eating ramen noodles when they were in college. They loved them. It was quick and easy. I saw when we moved my youngest son to his first apartment, he bought them by the case. (I must say your lobster edition sounds great. I love lobster.) My oldest son was and still is into the martial arts movies. You and he would have gotten along well. Fun blog! I love Ramen too and indulge secretly when the kids are off at school and can’t ask me to share. My favorite brand is Indomee. I love the slightly sweet indonesian flavoring and I like eating it dry instead of soupy. I love the idea of a Ramen party. Brilliant! WHOA this looks amazing. My fiance makes great instant ramen w/ fancy additions…but never lobster. I am now starving, hah. Thanks for sharing! Oooh, ramen with lobster sounds soooo delicious! I have a framed poster of the Nissin ramen boy in my kitchen except that my S.O. doctored it to look like himself. I used to eat Maggi when I lived in the Philippines. I didn’t even realize that you can get ramen noodles at restaurants until a couple of years ago. What do you think of ramen from ramen noodle places? Do you have any favorites? The good thing with instant ramen, when it comes down to the main ingredients, it is just noodles and a bag of instant broth – if you don’t add the spicy oil too, the calorie count may drop a bit. Noodles and instant broth are just “must have” basics for all kinds of food – very convenient. I had Miso-Ramen in Tokyo in a restaurant and it was not good at all 🙂 guess Instant Ramen with lobster will taste much better. Besides your party reminds me on a party my son once organized with his friends, ramen and martial arts movies and games (his room smelled like a zoo afterwards, these special kind of ramen smell lingered on and on). I just finished viewing your talk on “The Ghost Bride” and I must say that I enjoyed it very much.